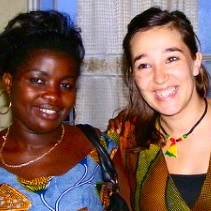 Elisa Garcia (Bureau pour le Voluntaries au service de l’Enfance et de la Sante - BVES): Elisa, a Spanish national, studied at the Université Libre de Bruxelles (Brussels, Belgium) from 2004 to 2005. In 2006, she graduated with a MA in Media Studies from the Universidad Complutense de Madrid (Spain), In September 2007 Elisa entered a PHD program at the University of Deusto (Bilbao, Spain). She graduated in 2008 with a MA of Peace and Conflict Studies. Between March 2008 and March 2009 Elisa served as a visiting researcher in the Peace Studies Group in the CES (Center for Social Studies) of University of Coimbra (Portugal). She has also interned at Scouts, Amnesty International and a nature preservation foundation. CONGO? ZAIRE? THE BELGIAN CONGO?